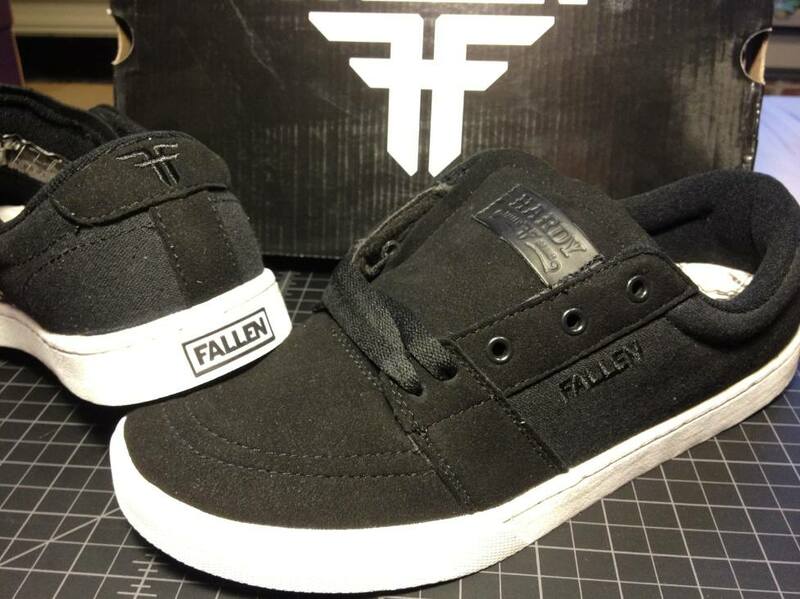 The Rambler is James Hardy’s new signature skateboard shoe from Fallen. Deceptively clever features make the Rambler look like a low-cut chill out shoe while maintaing some serious board performance. Vegan Skate Blog’s first look review gets up close before the shredding begins. Fresh out of the box we get a look of the construction of the Vegan colorway. A synthetic-suede toe cap, lace cage (with metal eyelets) and tongue cover the high traffic area of the shoe. 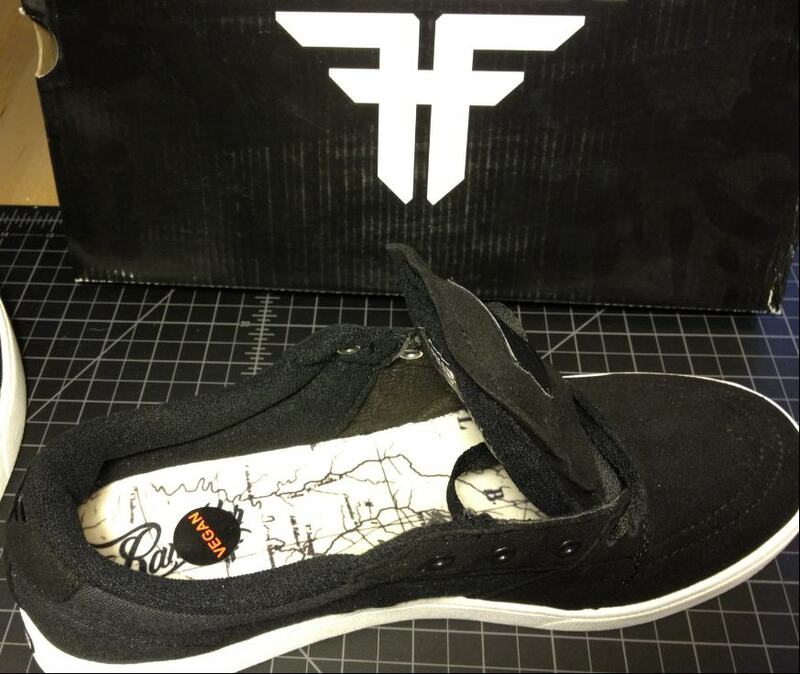 While the thin canvas sides keep the shoe light and breathable. Embroidered Fallen logo is on the canvas (and the big question answered), the Hardy name badge on the tongue is synthetic-leather. Speaking of the tongue, here is a get a good look from behind. The front facing piece has a cool stitched look, almost like a pair of soccer shoes. The back has a light pillow of padding to keep your feet comfortable. And despite being super low cut on the ankle, there is still some nice padding around the collar. With some nice foot contour it will lock into place on your heel and feels very connected. The insoles keep with the tradition of Fallen not missing an inch of detail and style, with the Rambler map print. And check out that sweet Vegan label! The soles and footbed, here are some of those clever features. They look like vulcanized soles. The treads certainly look the part as does the faux foxing tape around the nose. 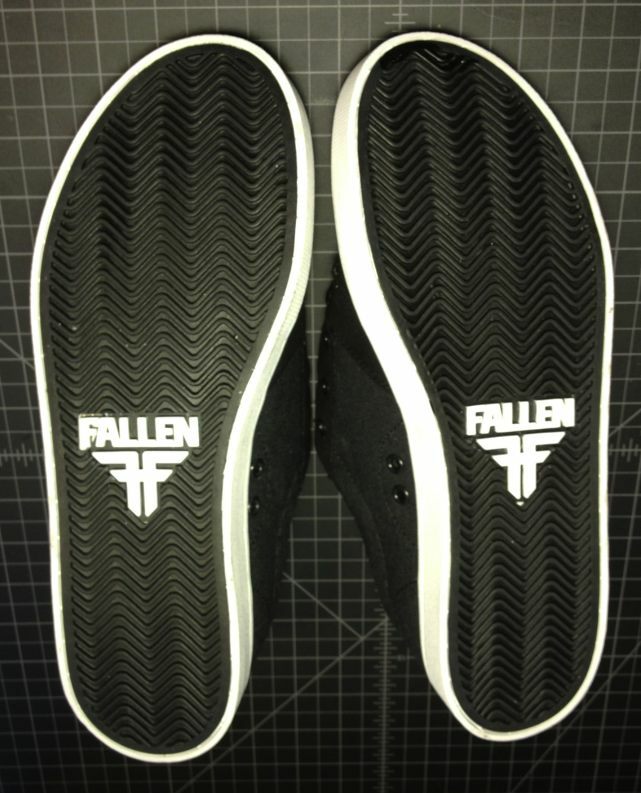 These are the Fallen FLX soles. Super light and lots of board feel. 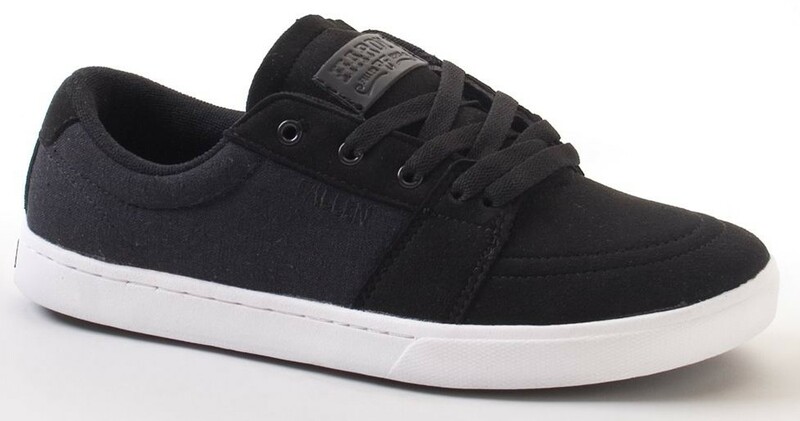 Effectively a hybrid of a cupsole construction and vulcanized board feel. Ripped Laces blog mentioned in a review for another pair of Fallen that the tread was deeper then some other shoes. Comparing to other shoes VSB is reviewing that seems to be the case. Hopefully this will lead to longer lasting grip surface. 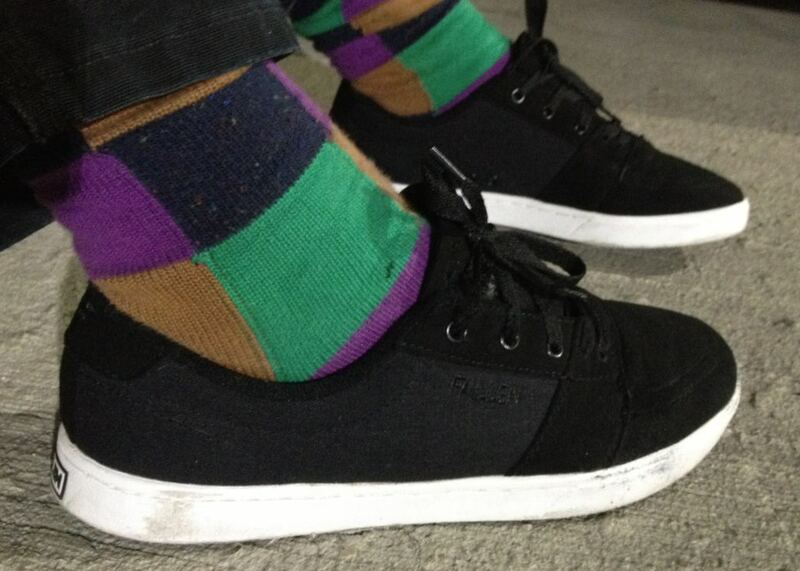 All laced up and ready to skate. When I first took them out of the box I was surprised by the weight of the shoe. I don’t think I have ever had a skateboard shoe that felt so light and I was a bit concerned. I took them for a spin and was pleasantly surprised. It was like getting onto a carbon fiber bike when all you have ever had before was steal. They feel like they should be flimsy but feel solid once they are on the feet. 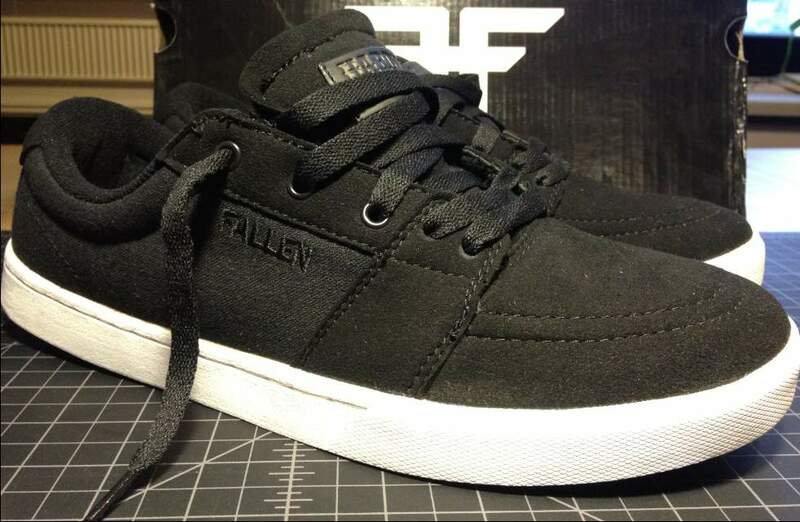 If you look to the back of this photo or when you get a pair, the curved scoop of the heel is very noticeable. I don’t know how much this may have to do with the grip the shoe has on the heal but it looks odd. I didn’t notice anything odd about skating in it though. They really are low cut, my ankle joint is way above the collar. I skated for two hours after lacing up the shoe. You can get them out of the box and ride with little to no break in time. VBS will check back in a few weeks with an update. Right now I am digging the shoes and my initial impression is very positive. Big thanks to Nick at BlackBox! how did the hsu’s turn out? or do i have to wait for another post! ?